(House picture included. 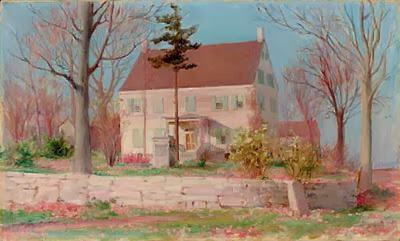 Caption: Built in 1793). The old colonial house at Quaker Ridge, built during Revolutionary days, called back old times Tuesday night. 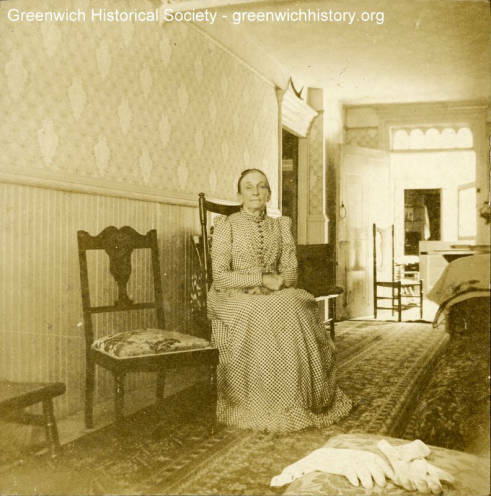 For around the old fashioned fire place filled with logs, there gathered a company of people who if not connected by personal contact with the early days of Greenwich, were in every other way linked with 100 years of the past in the aged building. 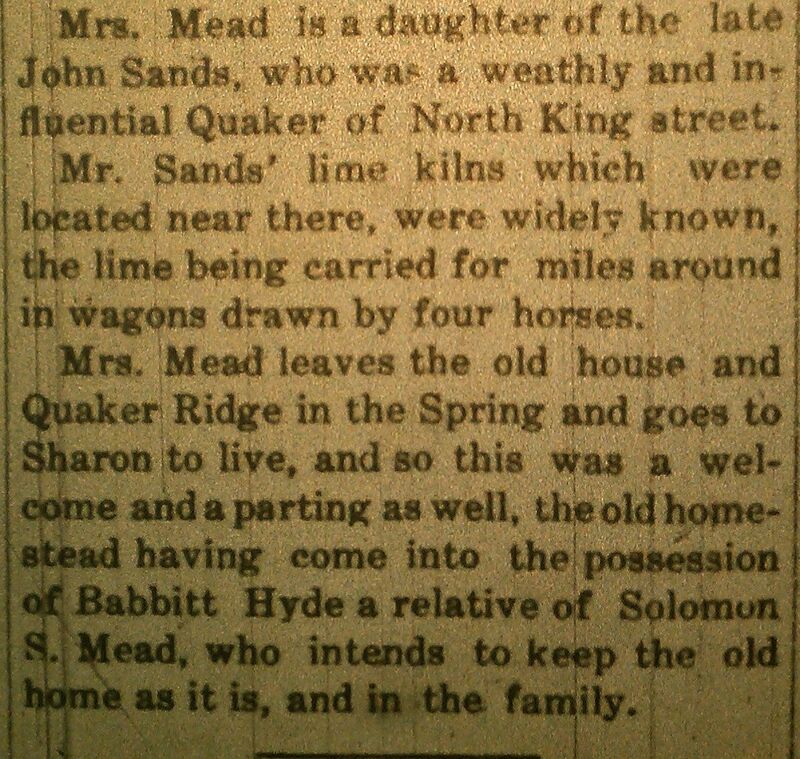 It was the birthday of Mrs. Mary E. Mead, widow of the late Solomon S. Mead. For 83 years she lived in that locality. And so her many friends sought to give her a surprise party to congratulate her on attaining that age, and to wish her every good, and that is why the old house and its fire places were besieged by neighbors and friends on that night. And it was a scene that would have delighted the heart of an antiquarian, for the setting was perfect, everything was real, it belonged to the house and the friends who came. The ladies wore costumes of a hundred years ago, the real thing, taken from old chests, high boys and closets, perfumed with herbs, having been worn by the mothers, grandmothers and great-grandmothers of those who were gowned in them. Silks and satins, gingham and linen, homespun some of them, all as they appeared years ago. The hair of the ladies matched their gowns, done in the old style, parted in the middle and over their ears. Big beads or something of that kind were at the side of the head. 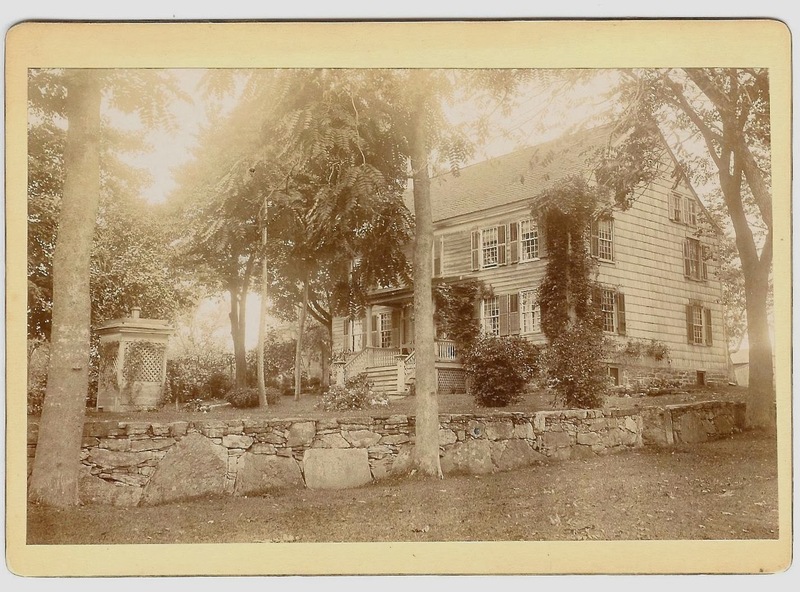 The furniture in the old house was rare, consisting of mahogany tables, chairs and beds, and matched it all. And to complete the picture the table where the dainty and bountiful collation was served was decorated with cut glass bowls, and candlesticks and silver in antique designs, that came, some from Holland and others from England, all old, very old, and genuine. A profusion of flowers gave grace, fragrance to it all. It was indeed an unusual affair, rare indeed in this day of the automobile. And it was a joy to be there. 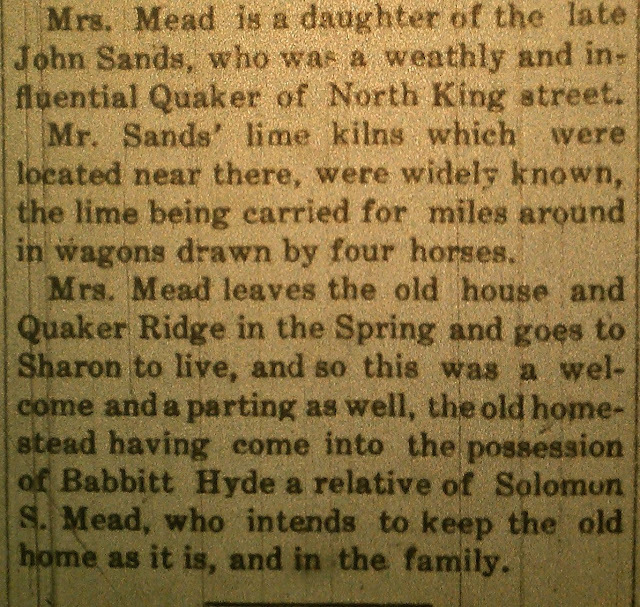 Mrs. Mead is a daughter of the late John Sands, who was a wealthy and influential Quaker of North King Street. Mr. Sands’ lime kilns which were located near there, were widely known, the lime being carried for miles around in wagons drawn by four horses. 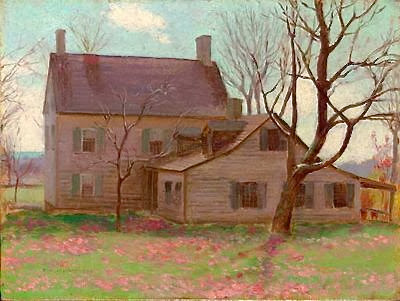 Mrs. Mead leaves the old house and Quaker Ridge in the Spring and goes to Sharon to live, and so this is a welcome and a parting as well, the old homestead having come into the possession of Babbitt Hyde, a relative of Solomon S. Mead, who intends to keep the old home as it is, and in the family.